There are many different types of sprinkler systems. Stationary sprinklers deliver water in an irregular pattern. The accumulation of water in the containers may vary from 8 inches an hour in one spot, to 2 inches an hour just four feet away. It may be almost nothing near the sprinkler head. There is no predictable pattern that leads to proper overlapping and efficient watering. However, it is unfair to label the sprinkler useless. As long as you know how it distributes water, it can be valuable for spot watering, or supplementing other types of sprinklers. Oscillating arms sprinklers deliver water in a rectangular pattern. Many observers believe that this type of sprinkler deposits most of the water near the sprinkler head. With increasing amounts toward the periphery is the arm moves away from the vertical central position. Well this is true of older models, newer versions stall momentarily when the arm is furthest from its upright position, thus evening out distribution at the periphery. The whirling head sprinkler deposits the largest amount of water close to the sprinkler head. The amount decreases the further away it goes from the source of the spray. Water distribution is uneven when the sprinkler is used without a system of overlapping. With a 50% overlap, efficiency increases and the sprinkler becomes quite useful. Impulse sprinklers are best for large areas and are commonly used for golf course lawns. And internal jet rotates the sprinkler, which delivers pulses of water covering anywhere from a full circle to a part circle. Coverage to your lawn is quite even. 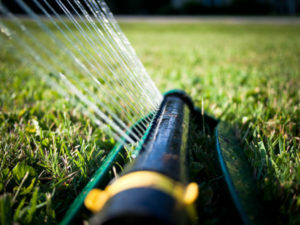 By combining the knowledge gained from experimentation and observant eye, it is quite easy to set up the watering schedule for your lawn with a portable sprinkler.